The Law Offices of John M Alton Co, LPA will find you the appropriate resolution to your pain and suffering in a court of law. You should be compensated financially for any suffering you have endured due to your accident issue. If someone has been negligent to you or caused harm or distress; I am here to assist you with all my effort. 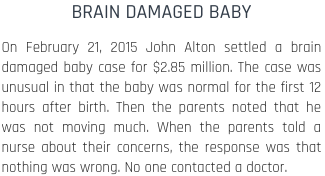 At The Law Offices of John M Alton Co, LPA, I take pride in being able to provide your accident case with as much attention to detail and scrutiny as possible. I always maintain contact with my Ohio area clients. I will ensure that you understand the legal process, everything that is happening and what the strategy is at all times. The Law Offices of John M Alton Co, LPA understands that you may be suffering and in pain and dealing with economic loss or emotional distress due to your accident matter. I am here to help improve your quality of life. With my legal guidance, I can help your accident case move forward without all the daily stress. With my nearly 25 years of legal experience, I know how to get the ball rolling on dealing with personal injury matters. Allow me the opportunity to explain to you what my services can offer your accident case today. 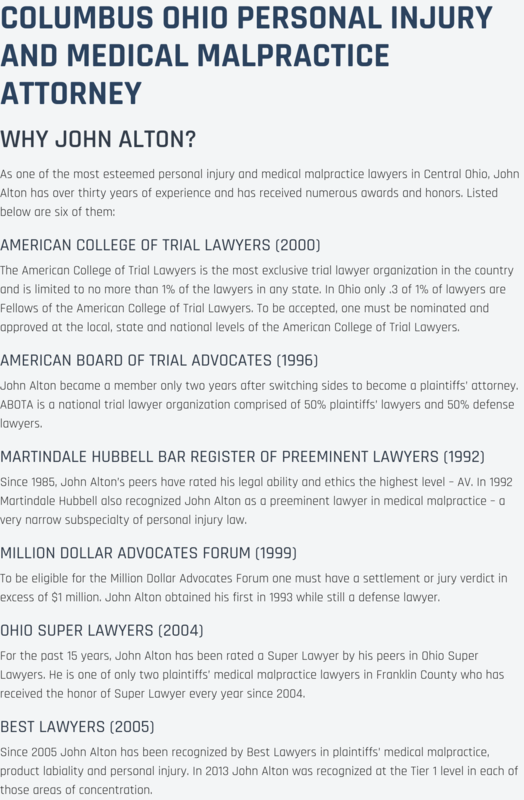 At The Law Offices of John M Alton Co, LPA we believe that anyone who is a victim of any accident action should get the highest level of personal service and professional representation possible. We do not just represent you as a law firm; we act as your advocates as we fight for your legal rights in any accident case within the Ohio area. 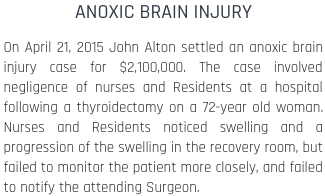 At The Law Offices of John M Alton Co, LPA we understand you need time to recover from your accident ordeal moreover an opportunity to regain some sense of normalcy. Call us today at (614) 221-6751 or visit our offices at 1071 S. High Street.